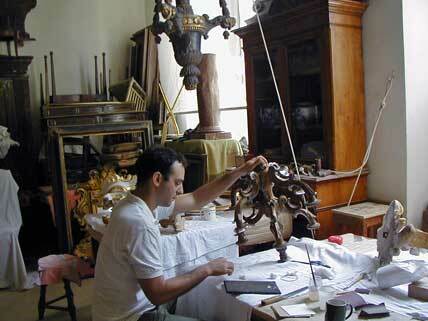 I helped restore these 18th century candlesticks and chandelier from Tuscany while studying and working as an assistant with the Chiaruggi Family, master restorers to world-renowned museums in Florence and elsewhere in Italy. 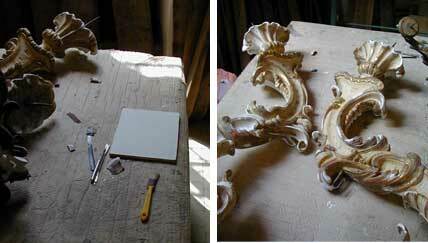 A carver filled in the missing chestnut pieces and I assisted in gilding, silvering and antiquing the restored parts. The water gilding process required several layers of gesso, applied here to only part of the piece. 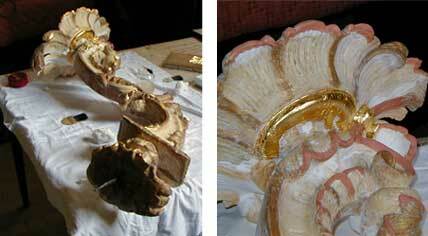 The surface was smoothed by sanding because gold leaf cannot be applied to a flawed surface.